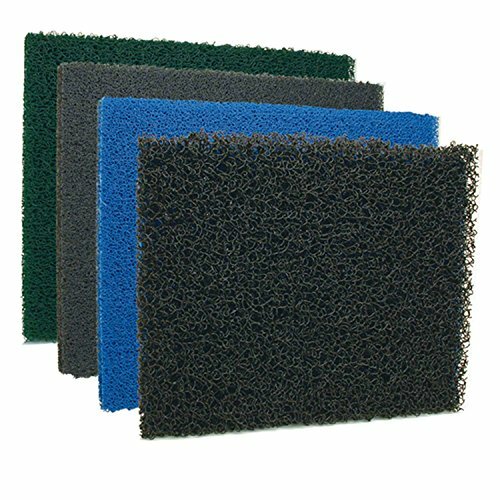 Black, Very Coarse (Low Density) Matala Mat Filter Pad - 24" x 39" The open, highly aerobic 3 dimensional structure of Matala Filter Media promotes healthy water conditions and ease of cleaning in a wide variety of filter designs. This is simply the most effective, longest lasting, crush resistant filter material available today! You'll see it featured in every major Pond & Koi & Fish Care Magazine. It is a vast improvement over the OEM filter mats standard with most filters/skimmers today & a fantastic upgrade for any brand filter or skimmer! Easily trims to fit Aquascape, Savio, American, Easy Pro, Laguna, Cyprio/Hozelock, etc. skimmers & filters just to name a few. Features: A choice of densities allow for step-wise transition from mechanical to biological filtration Excellent surface area per sq. ft. with good adhesion of nitrifying bacteria. A high number of interstitial spaces in the tri-dimensional matrix of the filter media improves an early and even growth of bacteria. High free volume for smooth, even water flow throughout. Very resistant to plugging & easy cleaning. Mats are self-supporting, form-stable, rigid and non-brittle. Easy to cut to fit with a Heavy duty Scissors, utility knife, circular saw or jig saw! Non-toxic to the environment. Light weight. Versatile and durable. Lasts for many years- 6+ (2-5 times longer than ANY other mat on the market!) 1 1/2" Thick OTHER SIZES AVAILABLE! Ease of cleaning in in a wide variety of filter designs. You'll see it featured in every major Pond, Koi & Fish Care Magazine. This is simply the most effective, longest lasting, crush resistant filter material available today! If you have any questions about this product by Matala, contact us by completing and submitting the form below. If you are looking for a specif part number, please include it with your message.